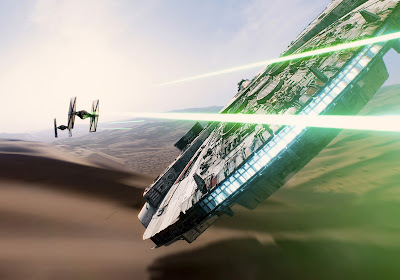 Guest blogger Ricardo Victoria has seen Star Wars already. Yes, we are letting the hate for him flow through us. Pesky staggered release dates. But here he shares a review of the movie that dodges major spoilers. ONE CAVEAT: The review does discuss briefly Luke Skywalker's role in the movie so if you want to know absolutely nothing about that, don't scroll down. The review starts after this really rather lovely poster. One of the apparent perks of living in Mexico, is that we got The Force Awakens as a midnight premiere a few days before the USA, so in true geek fashion I went to the event (it was my first time going to a midnite premiere of anything Star Wars related). Also, as I promised to Stephen and Brent, I would write a review free of spoilers, since they haven't seen the movie but want to be assured that it works. Thus, I ask you kindly to keep this clean of spoilers. Now, back to the movie. It works. It not only works, but I would dare to say that this is the best Star Wars Movie since The Empire Strikes Back. It is not without faults (I will go on to that later), but it felt like a proper Star Wars movie, even more that the Prequels (full disclosure, I liked the prequels, but I admit they are not very good Star Wars movies). It has the same epicness of the Originals and even just with the screen crawl blew away the prequels. You won't see fancy duels or philosophical debates, this is a proper non-stop (literally) action film in a far, far away galaxy that does a superb job of mixing old and new faces, makes you care about the newcomers and yet, it feels like home made cookies: full of flavor and love. 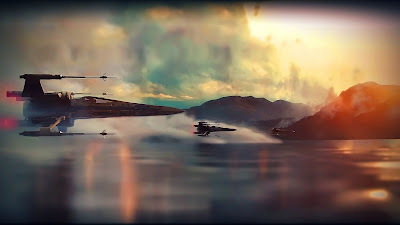 JJ Abrams has created the ultimate Star Wars fan homage, while keeping it a deserving entry of the saga. Interesting enough, while you can see the shared DNA of the previous movies in this one, you can also see Abrams keeping his own directorial choices and personal freedom. It doesn't feel like a bad parody, but as a homage made by someone that is a good director and a fan. The movie feels unique and familiar at the same time. Oddly enough, there are a couple of visual choices in two scenes that felt more like an Alien film or a Star Trek one, but nothing too jarring. The FX here is a mix between CGI and practical, taking the best of the previous six movies and casting away the jarring efforts of late period Lucas. There are also a couple of really hilarious scenes that help to flesh out, curiously enough, the stormtroopers. WHICH IS AFTER THIS PICTURE. Plot twists? Plenty, including a couple that anyone familiar with writing tropes or the mythos supporting the saga can see coming beforehand or guess with accuracy. Nonetheless, they still hit you in the gut as they should. Thankfully, no cheesy dialogue this time. Harrison Ford must be glad of that. And for those that were worried, the mystery of Luke's absence is solved in the crawl, so sit and relax. On the downside, the pace of the film is a bit uneven. It's not structured as the classical first act of a trilogy (like A New Hope was, despite being located at the middle of the saga chronologically speaking) and as such it feels like a weird epilogue mixed with a start of a new story. I'm not a fan of the soundtrack, in my opinion it's the weaker part of the movie. It lacks strength and force. And the plot hits some very, very familiar points that made me joke with my friends after it (I won't tell the joke because it would be a spoiler). By the time the credits were rolling, I ended up yelling that I wanted more. The final scene alone will make you hope that the next one comes fast. 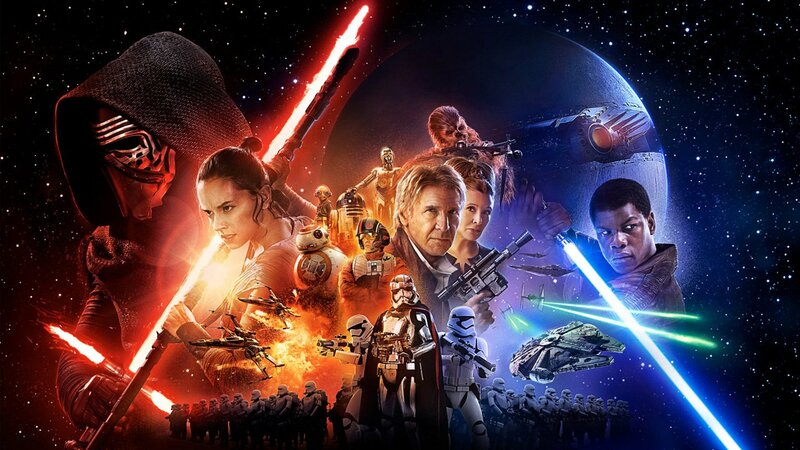 All in all, The Force Awakens is a great movie and a superb Star Wars movie. So I will end with this: if you haven't seen it, stop reading this and go to watch it now. If you have already seen it, go again and watch it. Now. And May the Force be with you. Always. P.S: It was odd to do not hear the 20th Century Fox fanfare at the start. In case you are looking for somewhere to discuss Star Wars: The Force Awakens with full spoilers - we've opened up a blog post here that you can make free use of. Want to compare notes with Ricardo on his review? You can catch him on Twitter here. You can also read Ricardo's fanfic story... What If Vader Survived? ... here.